Honey-Glazed Scallops are ready in just 15 minutes! Serve with rice and broccoli for a light and healthy dinner. Happy Thursday! Here are those scallops I promised you. We eat seafood often, but scallops always feel like a treat. A little luxury from the sea, if you will. Especially when I wake up early enough to grab them from our local Farmers market. Delicately sweet and melt-in-your-mouth tender… they’re worth the early rise. The thing I love most about high-quality fresh scallops is they don’t require much fuss or effort to yield INCREDIBLE results. Give them a quick pan-sear, coat them in homemade honey glaze, and get ready to find yourself in scallop nirvana. ↑ Not bad for a meal that takes less than 15 minutes to pull together! 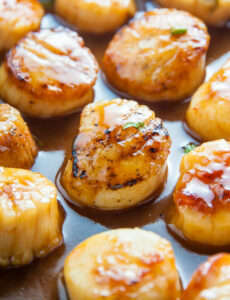 There are two super simple parts to this recipe: the seared scallops and the honey glaze. To cook the scallops you’ll need a skillet or saucepan that can handle high heat, unsalted butter (or ghee), and large, fresh sea scallops. You can definitely use a cast iron skillet if you own one, but be warned – they get SUPER smokey over high heat. For the glaze you’ll need low-sodium soy sauce, sriracha sauce, honey, Dijon mustard, and apple cider vinegar. This sauce is extremely flavorful, so be sure not to add any extra salt or pepper out of habit. The first time I made this recipe I lightly salted the scallops and found the overall taste WAY too salty. And I love salty food. The first thing you want to do is make sure you have high-quality scallops. I suggest using fresh, large scallops for this recipe. As mentioned earlier, I love buying mine from the fishmonger at our Farmer’s market, but you can also find great options in the seafood department of many grocery stores. Don’t forget to remove the side-muscles! If you look closely at each scallop you’ll likely notice a little tag of muscle tissue on the side. If you run your finger over it, it will feel tougher than the rest of the scallop and visually its fibers run opposite the rest of the scallop. To remove it simply pinch it with your fingers, gently pull it off and discard. If you happen to miss one, it’s not the end of the world! They’re chewy but 100% safe to eat. Pat your scallops dry! Wet scallops don’t sear well, so this is an important step. My favorite way to do this is by lining a plate with a double layer of paper towels, placing the scallops on top, then topping them with another layer of paper towels and pressing down lightly. 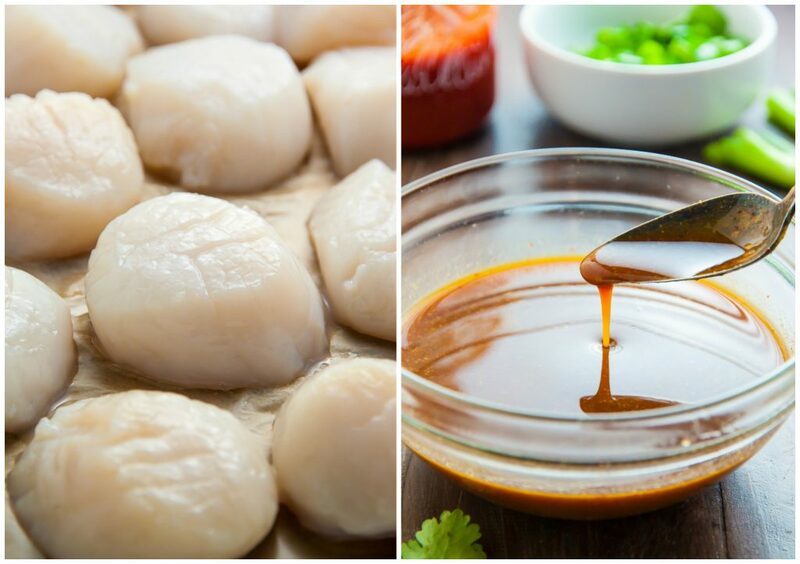 You want to squeeze out as much moisture as you can without crushing or damaging the scallops. Get your pan REALLY hot. You’ll want to heat your buttered pan over medium-high until it’s sizzling. You’ll know it’s ready when a few drops of water evaporate on contact. When you add the first scallop to the pan, listen for a loud sizzle; if you don’t hear it, wait another minute to let the pan heat before adding the rest. I highly suggest opening some windows and turning on your oven fan, if possible, since your kitchen will get a little smokey during this process. Don’t crowd the scallops! Place the scallops in the pan in a single layer, spaced at least a half-inch apart. Cook the scallops in batches if necessary. To avoid tough and chewy scallops, be sure not to over cook them. Sear them on one side – without moving them – for 2 minutes, then flip them over and sear for another 2 to 3 minutes. That’s it! If the scallop doesn’t easily release from the pan, simply let it sear for another few seconds then try again. Both sides of the scallop should have a golden brown crust. If you’re serving these honey-glazed scallops as part of a meal, you should have everything else ready to go before placing them in the pan. I love serving them with rice and broccoli, so I always have them ready to go before getting started on my scallops. Serve warm! Scallops are truly best served RIGHT away. If they sit too long they lose their creamy texture. Next time you’re craving a restaurant-quality meal at home, give these honey-glazed scallops a shot! 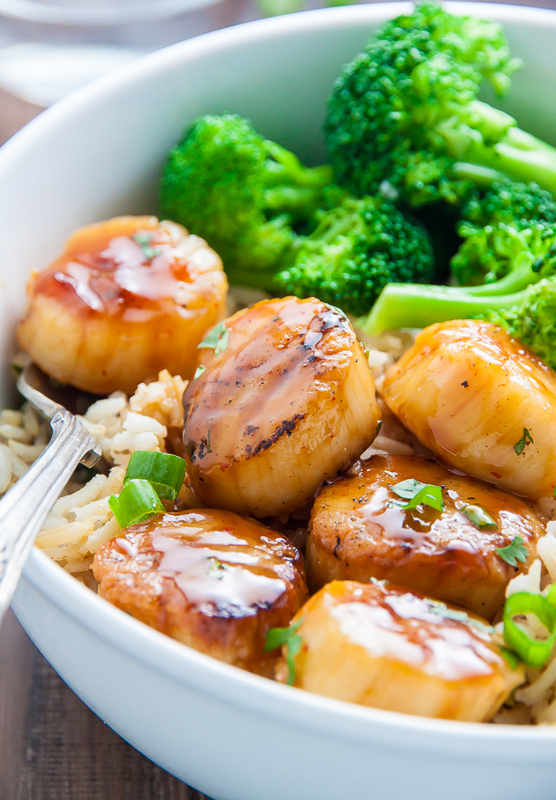 I love serving my honey-glazed scallops with garlicky broccoli, steamed rice, and an extra cold glass of white wine. What will you pair them with? 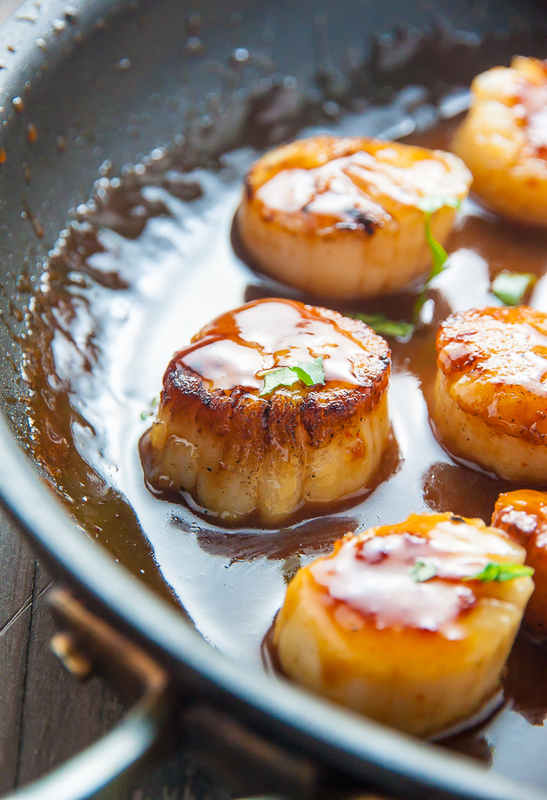 Sweet and just a little spicy, these Honey-Glazed Scallops are ready in less than 15 minutes! I love serving them with brown rice and broccoli. In a small mixing bowl combine the low-sodium soy sauce, sriracha, honey, Dijon mustard, and vinegar; mix well to combine then set aside. Vigorously pat scallops dry using a double layer of paper towels; set aside. Heat 1 tablespoon of butter (or ghee) in a large skillet over medium-high heat. Cook scallops, in a single layer, until golden brown and just cooked through, about 2 minutes per side. Cook scallops in batches, if needed, adding the remaining butter or ghee when the pan begins to look dry. Transfer cooked scallops to a large plate and set aside. 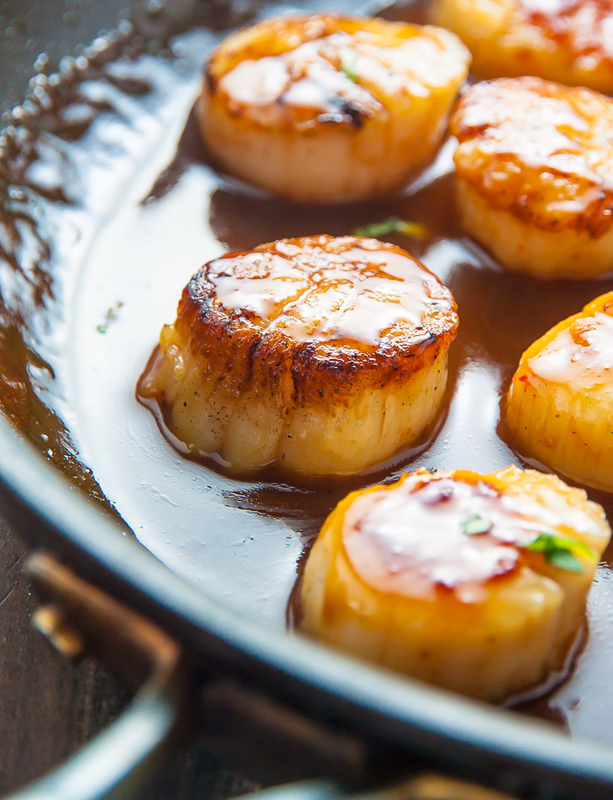 Using the same skillet you cooked the scallops in, reduce the heat to medium-low and carefully add in the honey mixture. Simmer for 2 to 3 minutes, or until it's reduced to a glaze. Quickly return scallops to skillet and toss well to coat. Sprinkle with cilantro and scallions, if desired, and serve at once. 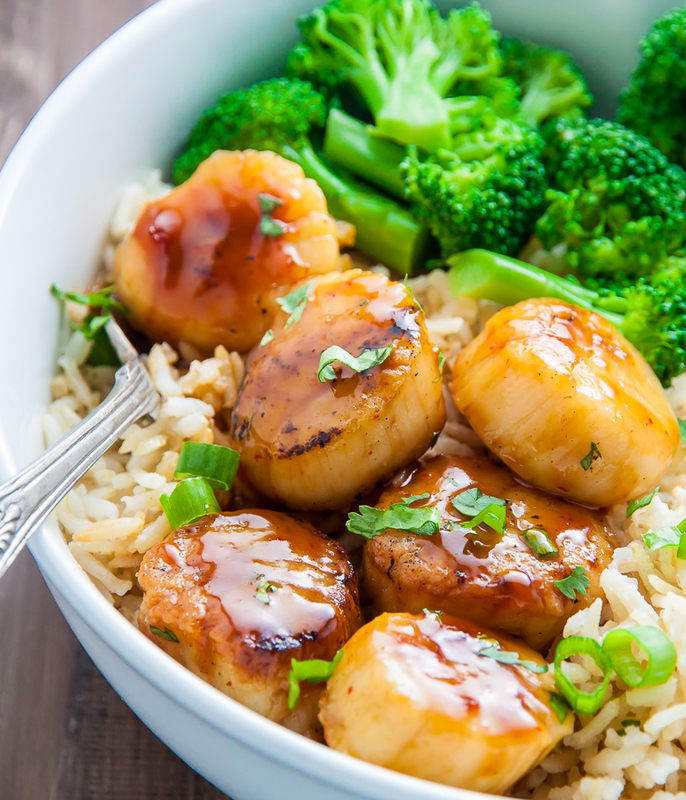 I love serving these scallops with brown rice and broccoli! Scallops are best eaten the day they are cooked. Be sure to remove the tough muscles from the side of each scallop. Scallops may be served as an appetizer, or used as a main course for any meal. Be sure not to over cook the scallops or they will come out tough and chewy. I made this for my husbands birthday dinner and it was a HUGE hit! Can’t believe how easy it was and so delicious we both said we must make it again this week. Thank you so much ashley . I made this for my wife tonight. She loved it! Thank you! Best scallops I have ever made. Will be a repeat recipe.My husband loved them. Will make for company soon. Really want to try this recipe as I love scallops sooo much. But I don’t have access to fresh sea scallops, since I live in the Midwest U.S. I can only get them frozen at the supermarket. Will that make a big difference in the recipe outcome? This was very good even if I didn’t follow it to a T. It had some awesome flavor. Loved it. Thank you for the delicious recipe! I used a combination of shrimp & scallops but followed recipe otherwise! Served it with cauliflower rice & roasted broccoli. Not too spicy for me. My son & husband added additional siracha sauce & red pepper flakes – they like everything hot/spicy! It was a crowd pleaser! I made this last night for dinner, I actually added a shot of soy sauce, Huge hit in my home. Thanks for the tip of peeling off the side, I’d never knew about that. Awesome! Keep up the great recipes. Next time I may add shrimp and double the sauce.